Heat oil in a medium pot over strong heat. Add the onion and saute it lightly. Add the minced meat and saute it well. Add the tomato paste, salt and pepper and cover in water. Let the mixture boil until there is only few sauce remaining, and then add some basil and remove the pot from the heater. Fill a large pot with lightly salted water and bring to boil over high heat. Once the water is boiling, stir in the spaghetti and return to a boil. Then heat some oil in the pot and add the pasta. To prepare the "Bechamel" sauce, first boil the milk. In another pot, heat the butter until it melts, and then add the flour and saute it for about a minute. Add the milk quickly and mix it vivaciously until the sauce gets firm. Remove the pot from the heater and add some salt, pepper, the nutmeg, milk cream, egg yolks and 1 cup of the cheese mixture. Spread half the pasta in an even layer on a deep pan. Then cover the pasta with some cheese and half the minced meat. Spread the rest of the pasta, cheese and minced meat in the same manner. Cover the top with the "Bechamel" sauce and sprinkle with the remaining cheese. Finally, cover the pan with a sliver foil and bake at 360 degrees F (180 C) for 45 minutes and afterward remove the silver foil and cook for 15 more minutes. Let your "Pasticcio" cool for 15 minutes before serving and enjoy your meal! P.S. For those of you that are self-conscious a serving of "Pasticcio" has about 690 calories. This recipe is rather famous in Greece. 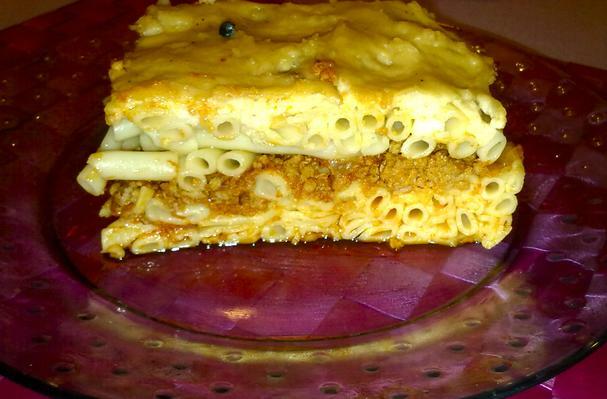 "Pasticcio" is one of those foods that Greek people enjoy at family meals often. It is really tasty and I am certain that you will enjoy it if you decide to cook it! Comments are welcome.